No more missed sentences or paragraphs! Ecco is great for repetitive texts - but with its Dictionary and text expansion macro features it's great for non-repetitive texts, too! Full-featured text editor with parallel text display (Source and Translation side by side). Search in Source/Translation and see corresponding Translation/Source. Integrated Dictionary Database (terminology management). Create separate dictionaries for each language-subject combination.. Terms in your dictionaries are looked up automatically. One-keystroke insertion of found term in text. Translation memory (TM): match automatically (optional fuzzy matching) with existing translations, or search manually. Import existing translations, either from separate source/translation files or from TMX files (generated by other TM tools: TMX is the industry-wide standard exchange format for TM, supported by all the leading TM products). Export translations from Ecco in TMX format. One-keystroke Copy (all or part of current Source sentence to Translation). One-keystroke number copying, or automatic copying of numbers (and codes). Text expansion macros (like Autocorrect, but more intelligent). Automated transfer of documents between Ecco and Word for Windows, preserving as much formatting as possible. True 32-bit application, so no practical limitations on file size, size/number of dictionaries/dictionary entries/macros etc. Fully integrated application, no expensive add-ons required. Only USD 450 (incl. handling charge) for fully functional product: no hidden extras! Ecco supports the "keyboard languages" installed on your Windows system (in Control Panel | Keyboard | Language), including those which use "non-Western" scripts (e.g. Cyrillic, Greek). Other languages (e.g. Chinese, Arabic) are not supported. 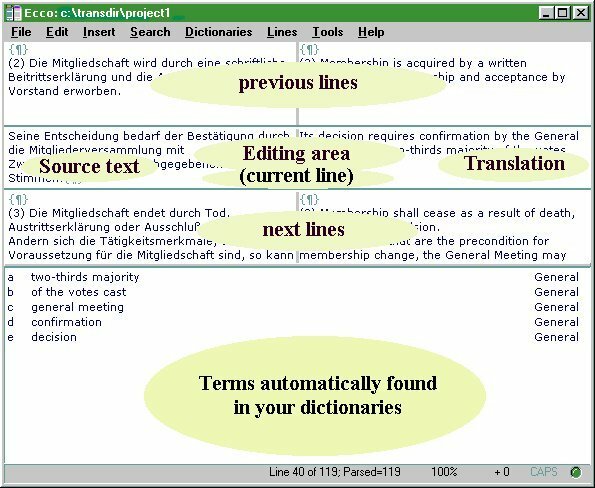 The Dictionary import/export and TMX import/export functions only support languages which use "Western" script (English, French, German, Italian, Spanish etc. ).